Laura Perille, interim superintendent of Boston Public Schools, attended a School Committee meeting Wednesday. Nearly a dozen educator, parent, and civil rights organizations on Wednesday called on Mayor Martin J. Walsh and the School Committee to bar interim Superintendent Laura Perille from applying for her post permanently. The opposition comes more than two months after Walsh and the School Committee appointed Perille as the system’s temporary leader to replace former superintendent Tommy Chang, who resigned. It’s the latest uproar to hit the school system, which has been grappling with late buses and uncovered routes in recent weeks. Perille, in an interview after Wednesday’s School Committee meeting, declined to say whether she would seek the post permanently. She has been noncommittal about her plans in the past. Perille, the former head of a Boston nonprofit, EdVestors, has never run a school system before and never worked as a teacher or principal. As of Monday, Perille had not yet secured a license from the state Department of Elementary and Secondary Education to work as a superintendent. State rules allow an individual to work as an unlicensed superintendent for 90 days. A Walsh spokeswoman had little to say about the letter. 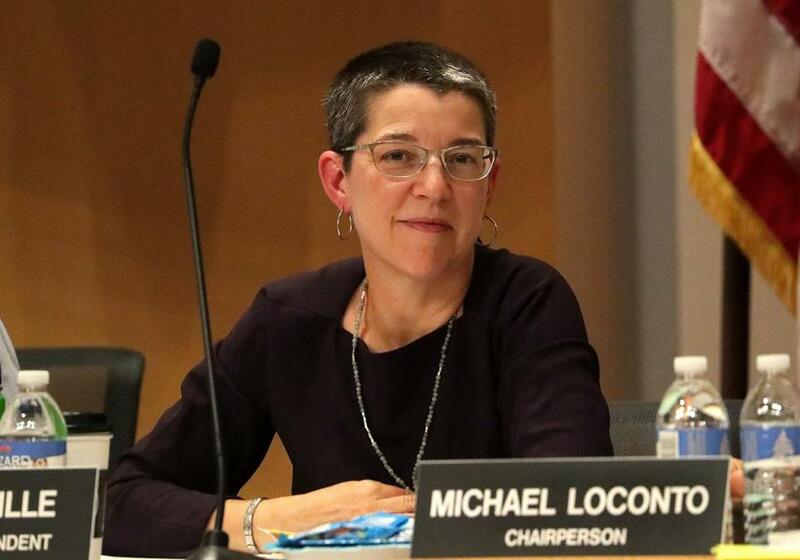 Michael Loconto, the School Committee chairman, declined to comment after the meeting, saying he had just received the letter and hadn’t had a chance to read it yet. The groups presented their concerns to the School Committee Wednesday night. They are also asking the committee to set a clear timeline for choosing a superintendent, and said they did not want the decision about who would be the next superintendent be made behind closed doors. The committee has yet to appoint a panel to seek out and vet candidates and had not planned to discuss the superintendent search at its meeting Wednesday, according to its agenda. It was the committee’s first meeting in two months, and school systems typically begin their searches in the fall. He also urged the committee to appoint a diverse group of students, teachers, educators, and community members to recruit, vet, and recommend finalists for the job. “These voices must not be silenced in favor of private foundations and business interests,” he said. The statement was signed by the Black Educators’ Alliance of Massachusetts, the Boston Branch NAACP, the Boston Network for Black Student Achievement, Citizens for Public Schools, the East Boston Schools Family Coalition, the Union of Minority Neighborhoods, and Start Smart BPS, among others. Some parents — separate from the minority organizations’ statement about the superintendent search — voiced concerns about the system’s late buses in public testimony. School officials have remained largely quiet on the issue amid contract negotiations with the bus drivers union. Julia Mejia, a founder of the Collaborative Parent Action Network, said she had received many calls from non-English-speaking parents and undocumented immigrants worried about their children being dropped off late at stops in the afternoon. She said it was especially troubling amid heightened concerns about ICE raids. “I think we need to do a better job with parents who don’t speak English and are undocumented . . . so they are not worried their children have been snatched up,” she said. The school system, which spends more than $120 million annually on transportation, has been struggling with tardy buses and uncovered routes for at least two weeks — initially at more than a dozen charter schools that began their year early and then more broadly after the Boston Public Schools officially began classes on Sept. 6. Perille said during the meeting that the school system is taking the concerns about the buses seriously and is working diligently to fix them. “Are the numbers great? Not at all,” said Perille, noting her children rode the buses when they were young, but also gave a shout out to the transportation staff, school leaders, and others for working tirelessly on the issues. The problems persisted Wednesday morning as 28 percent of the buses showed up late to school, potentially affecting thousands of students. The school system shuttles about 27,000 students a day to about 270 public, parochial, charter, and private schools, including certain special education programs beyond the city’s borders. The late buses — a perennial headache for families across the city — are increasingly testing the patience of parents and have created extra anxiety this year as the school system’s transportation contractor, Transdev, has been unable to secure a new contract with the bus drivers union, which has threatened to picket if members cannot get a fair deal. Two weeks ago, school officials attributed late buses and uncovered routes to a large number of unexpected driver absences, raising concerns among schools and families about a possible labor action. But the union subsequently issued a flier denying any organized effort and instead blamed Transdev for failing to hire enough drivers, an issue that Walsh also expressed frustration about. This week, two private bus companies told the Globe that more than two dozen of their drivers quit before Labor Day and took jobs driving buses in Boston for Transdev. The School Committee, at the start of its meeting, went behind closed doors to discuss the negotiations with the bus drivers union, which is part of the United Steelworkers.